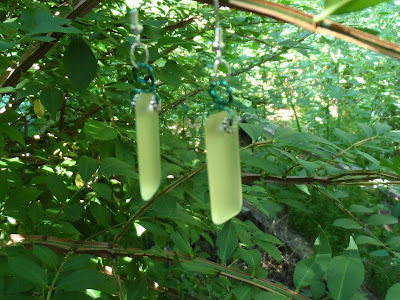 Another Pine Ridge Treasures blog hop is here! The participants ordered a surprise package of beads and coordinating metal pieces from Lisa Lodge, which portray the theme of "A Sunny Day." I actually managed to grab a pretty nice picture of the package contents when they arrived. It's a sun. Or a flower. A pendant. 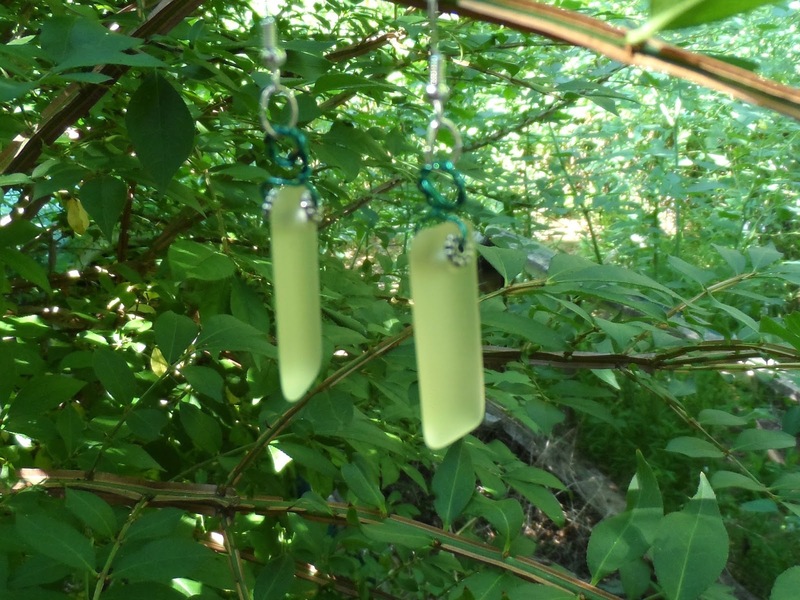 Or a suncatcher. Look at the pretty green wire! I like it, but can't really figure out what to do with it. I'll put it aside, and think about it. Yellow earrings with green wire. These earrings came next. 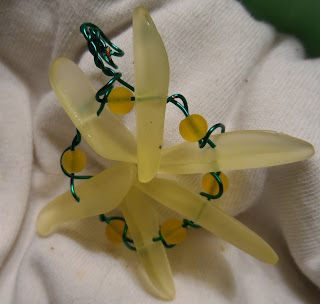 I again used the green wire, with the pretty yellow drops, and some flower shaped spacers from my stash. 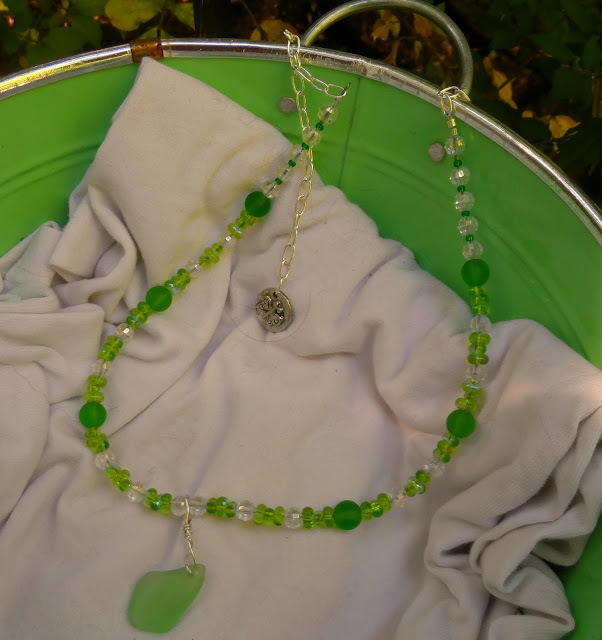 When I next picked up the beads, I started to understand that a lot of my sunny days were appreciated by looking at sunlight through the foliage that surrounds our home in the country. 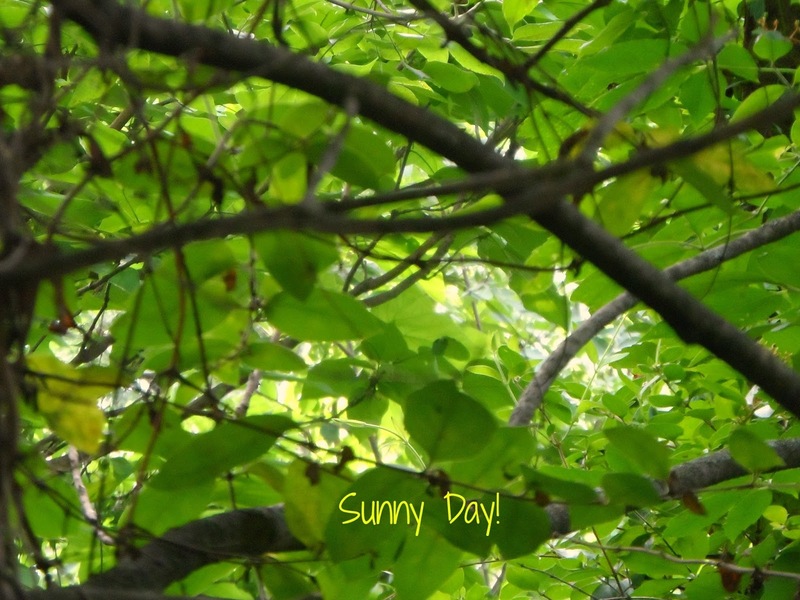 Sun filtered through the leaves. 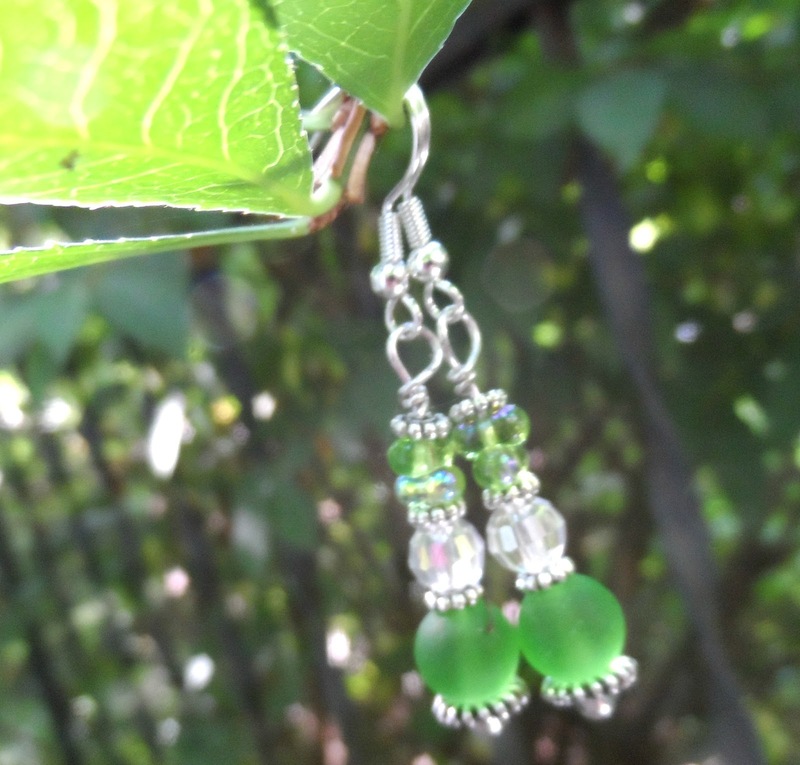 And the tiny little iridescent green beads in my kit really mimicked that sunshine-through-the-leaves effect. 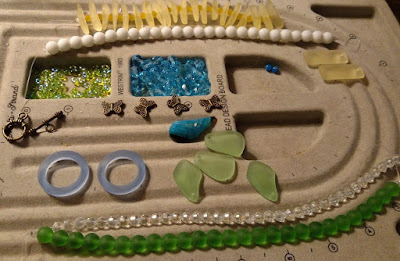 I set to work designing a necklace with the delicate green pendant I made from some of the faux beach glass included. And those little green sunshine beads. 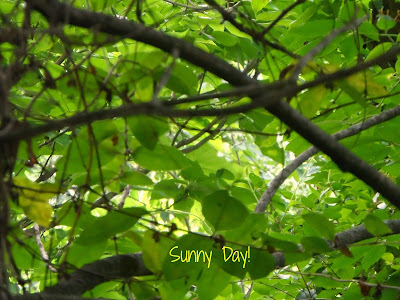 Looks like a Sunny Day to me! 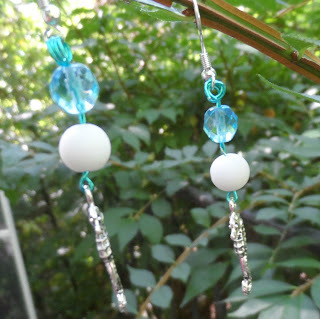 I strung the beads, then attached chain to the ends for an adjustable fit. A little butterfly charm finishes the clasp. Some earrings to go with the theme. First, a little beachy look, with seahorse charms, and wire that coordinates with the pretty blue beads. The seahorses aren't shown to their best advantage, but you get the idea. 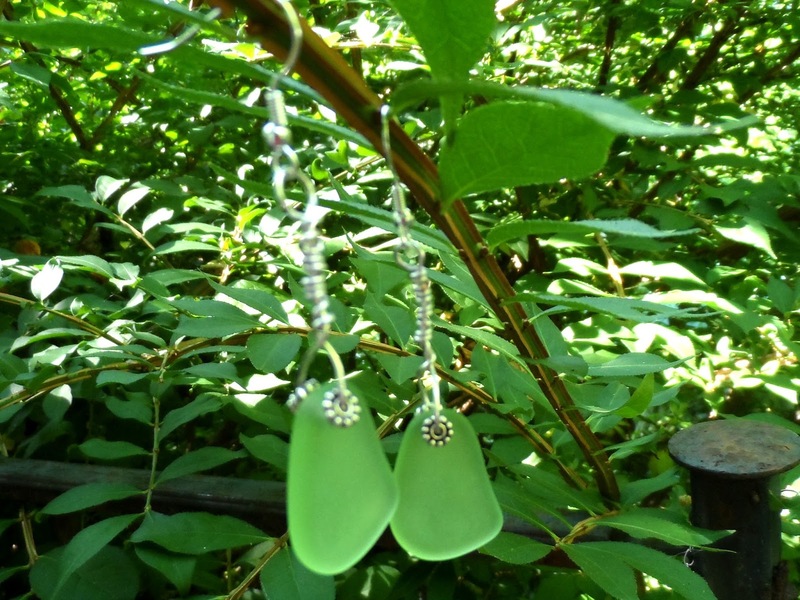 These are meant to coordinate with the necklace, but look great on their own. More glass and little flower connectors. The sun-through leaves theme again. Also meant to coordinate with the necklace. See how the little green beads catch the light? Thank you Lisa for hosting this Hop. Can't wait to see others' take on the Sunny Day! Labels: A Grateful Artist - Pine Ridge Treasures, beach, blue, earrings, green, leaves, Lisa Lodge, necklace, Sunny day, white, yellow. Your necklace is beautiful Beti. I like the earrings too. Excellent pieces Beti...I like how you used the outdoors to give you inspiration. The beach was mine.. Thanks. I sneaked a little beach in there, too. Very pretty pieces. Really enjoyed the theme of sunlight through the trees. Thanks for looking. I am a little bit obsessed with the green light now. Beti, everything is gorgeous! I would use the flower as a pendant! I think it is terribly cleaver! Thanks. I like that piece too but I think the wire is a little soft and fragile for the weight of the beads. I love your pieces and the theme of the sunlight through the trees. That's what I see every morning on my way to work, our streets have huge old trees and in the summer it's like driving through a green tunnel. I love your collection, Beti! I can really see the "sunlight through the trees: in your pieces. I love the green necklace with the butterfly. Thanks for being in the hop! This kit really spoke to you. Great summery designs. I would use that focal to dangle off a ceiling fan chain. Your collection is so fresh and fun Beti. The fact that you could use so much green in one piece and make it work so perfectly is amazing!!! Really nice work!! !